Henrico Roofing Va offers Free No Commitments roofing consultations with estimates for roofing repair, roofing replacement or a new roof system. We have only experienced, licensed and insured employees working on your roof. 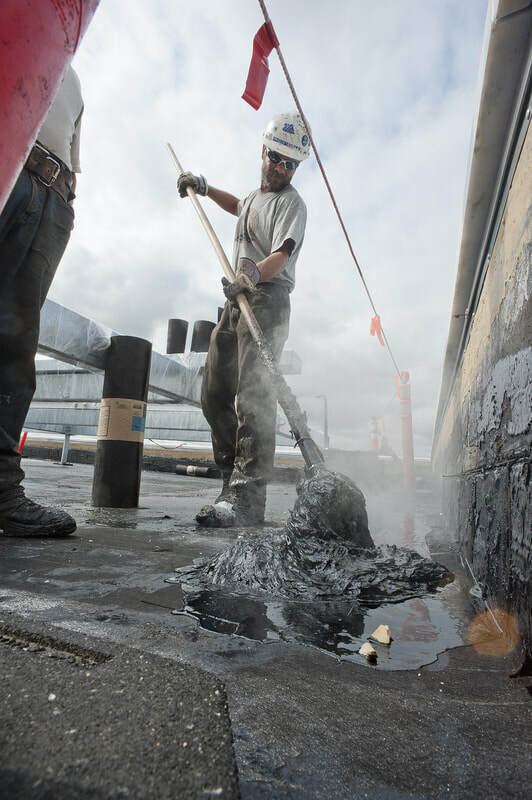 A Tar and Gravel roof is a flat roof treatment method of protection against the elements uses alternating layers of tar(Bitumen), versus roofing felt or fiberglass fabrics. A final top off layer of gravel protects the roofs buildup of the waterproof membrane from foot traffic and impacts. The number of layers on the roof is the number of piles on a roof (a four-ply roof membrane means the roof is a 4-pile construction). They are used on commercial buildings with large roof spans. ​These types of roof have been manufactured on roof tops in the USA for 150 years so we know a lot about how to make them last- it’s pretty much all due to obtaining an expert application. Coal tar is heated in a kettle or tanker and then applied by a mop or spreader. Note: hot tar is very smelly so it’s not used on residential home as many people are sicken by the smell. First coal tar is applied then the fabrics called roofing felts or ply sheets (produced in a standard width of 36 inches). Alternating layers are built up till the last one of tar topped with gravel finishes the roof. This type of roof is fire-resistant because of the gravel top, and can last with periodic maintenance 30 years or more. Caution: hot tar is very hazardous to work with so this type of roof should always be done by a professional. The average installation costs are $3.50 to $7 per square foot. Thus, a 4000-square foot office building would be on the lower end $14,000. Roof leaks are the most unwelcome problem for a business because inventory and store contents can be ruined. Roof leaks most often occur along flashings, seams and because of storm damage. Ponding water on the roof, caused by low spots, can often lead to leaking. Drains can be clogged causing a water backup because of roof debris. Service agents for H VAC can rupture the waterproof membrane by dragging equipment across the roof during repair service. Note: Property owners will often place a sacrificial roofing felt pathway over the assumed areas of high traffic on the rooftop.